Use of the university seal is restricted to official university documents (such as diplomas, certificates, and commencement programs) and presidential documents (such as inauguration and event invitations). The seal should not be altered in any way, nor should it be used in any trivializing manner (for instance, screened or cropped). For guidance on appropriate uses of the university seal, please consult Marketing Communications, 541-346-5280 or tjordan@uoregon.edu. The formal identifier of the University of Oregon, the university seal was designed by Judge Matthew P. Deady, who served as the first president of the UO Board of Regents. On February 21, 1878, Deady submitted a memo to the university board with his idea, and the university seal was approved. The university seal embodies the unique natural beauty of our state. In its center is a representation of Mount Hood as a symbol for Oregon. 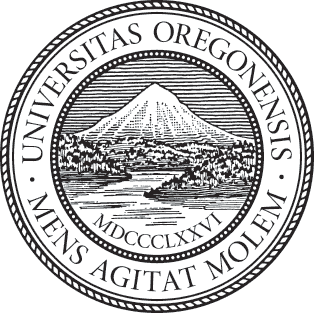 Encircling the central scene is the university's name, Universitas Oregonensis, and its motto, Mens agitat molem. The founding year of the university, 1876, appears in Roman numerals, MDCCCLXXVI. The scene depicted is Mount Hood with a glacier coming down into Lost Lake. At times the seal used has had a boat in the water—this first appears in the late 1890s, and it sails in and out as time passes. It was not a part of the original seal as accepted by the board. The university's motto is from Virgil's Aeneid. Many scholars have translated it from the original Latin, and though the word agitat may also mean "create" or "activate," Deady preferred "mind moves the mass." Perhaps inspired by the imagery in the seal, it is sometimes translated “minds move mountains" by university personnel. However translated, the motto is a reminder of the power of learning and of the university's commitment to the life of the mind.